What this waterfall lacks in height, it makes up for with a spectacular setting beneath towering cliffs that create a "cathedral" that amplifies the sound of the falling water. 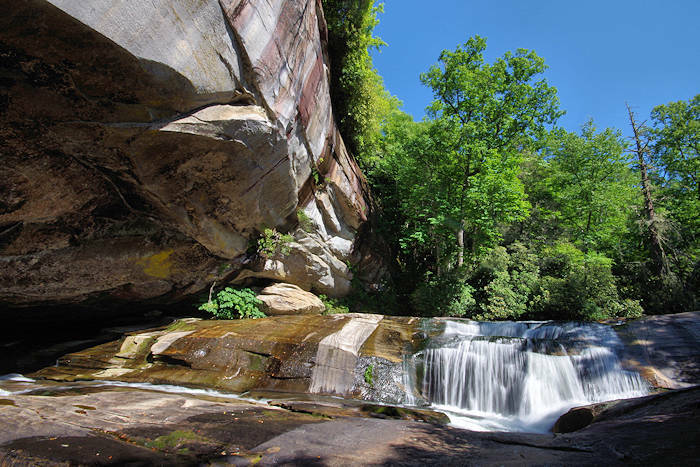 Cathedral Falls (also known as Bird Rock Falls) is an easy and super scenic riverside walk from the Forest Heritage Scenic Byway (NC Highway 215). 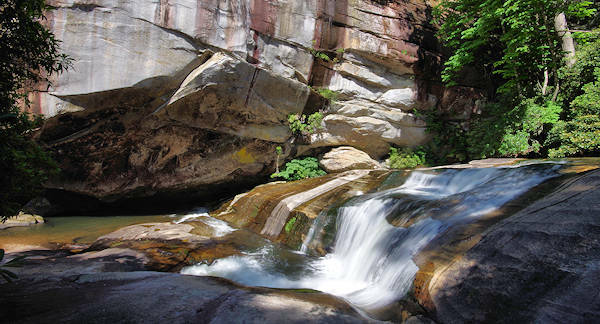 Along this hike, you'll also see French Broad Falls and Mill Shoals. The quarter-mile trail along the cascading river includes a few shaky, wooden bridges. So watch your step! It's on private property (Living Waters Retreat), but they welcome visitors. Park along the road by signs that say "Private Property, Enter at Own Risk." To the left of these signs is a short trail that leads to the North Fork of the French Broad River. It's a heavenly walk for waterfall lovers and super easy for all to enjoy. Along the way, watch for a few short side trails to the right to see even more cascades safely from rock plateaus perfect for picnics. You will even pass a grotto tucked in the rock cliff with stone bench. The soaring setting at Cathedral Falls is definitely a challenge to capture in a photo! After a big rain, small waterfalls form over the ledge of the cliff for added beauty. 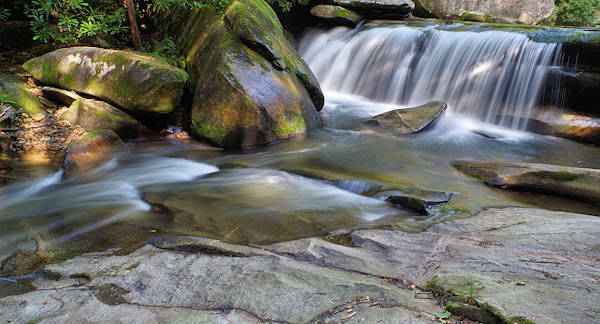 Be very careful on any wet or moss-covered rocks (and stay out of the rushing water). They can be very slippery and dangerous. From the Blue Ridge Parkway: Drive NC Highway 215 South about 9.2 miles and park on the right just beyond the Living Waters sign. It's about 50 miles from Asheville via the Parkway or US 64. This is just one of many waterfalls along NC Highway 215 between the Blue Ridge Parkway and US Highway 64 near Brevard. About six miles away north on NC 215 is Courthouse Falls. 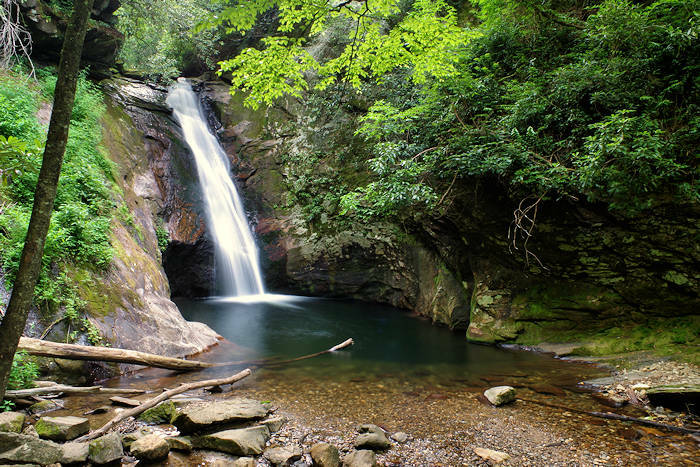 Continue toward the Blue Ridge Parkway and beyond on NC 215 for Dill Falls, Wildcat Falls, and Sunburst Falls. 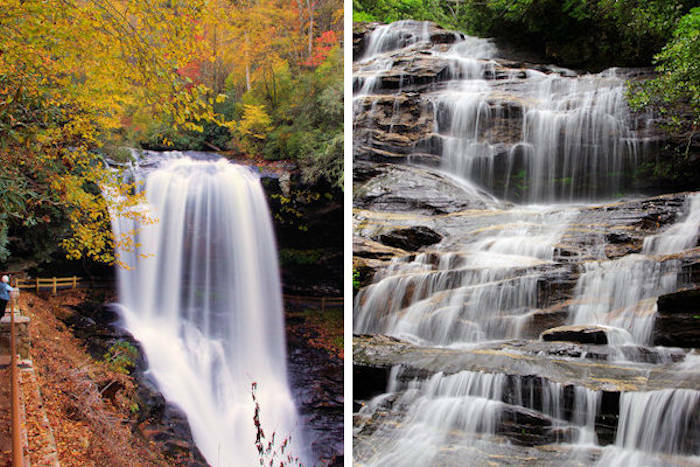 Located 12 miles south (near Highway 64) is Eastatoe Falls. 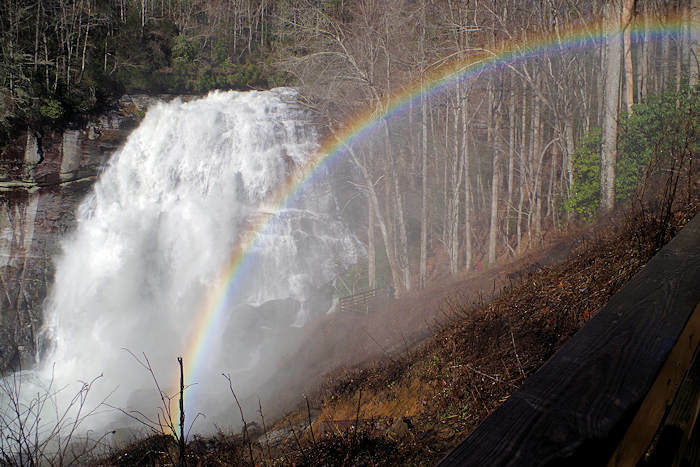 18 miles away is Rainbow Falls and Gorges State Park and it's 30 miles to DuPont State Forest waterfalls. Also see waterfalls in Panthertown Valley.